Remember this moldering beer? So I finally bottled my lambic, after brewing it last December. It was something of a larger investment of time than any other beer I've ever made, especially considering it's got another month to go before I can hope for any kind of carbonation to build up in the bottles. But I'm pleased with the results. For the brewing, I fermented the beer with a standard dry ale yeast and Brettanomyces Lambicus, after I soured the wort. Over the past 11 months, I've checked in on this beer from time to time, siphoning little samples with a wine thief. Now I chose to use a pure strain of Brett. because I enjoy those bold, sour, horse-like flavors in Gueze-style blended lambics. But wow...this came out pretty intense. 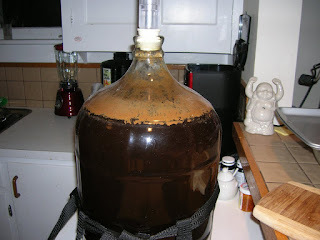 I actually felt it was too barnyard-y and horse-esque on it's own, so in October I added 3/4 lb dry malt that I boiled in 2 cups water, along with a new inoculation of a lambic yeast blend. The blend features other strains of yeast, besides pure Brett. I hope this will add a bit of the citric sourness that usually accompanies the sharp, earthy notes in a lambic, but only time will tell. I also filled up some larger 750 ml bottles for aging. Many lambic fans talk of how amazing a lambic can become after 3-10 years, which is a lifetime in beeryears! Even high-alcohol Belgian beers like Chimay are supposed to reach their peak at five years. So it's fascinating to me that a relatively low-alcohol beer could still age well, solely because of the intensity of the yeast living inside it. Again, another marvel in the world of food preservation.